Conveniently located at 116 Main Street in Islip, New York, NY 11751. 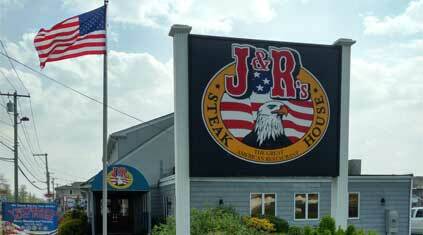 J&R’s is serving up the best steaks, chops and seafood in Islip. Check out the Best Lunch Deals in Islip! Try our daily blackboard specials. Host your next catering event with us! Veterans Eat Free on Mondays and Tuesdays- see menu for details. Visit the lounge for satisfying drink specials and try our selection of Beer on Tap. Present PRINTED COUPON to server when ordering 2 entrees of $15 or more for lunch or dinner. Excludes sampler appetizer. Up to $9.99 value. May not be combined with any other discount or offer. Good until expiration date.